Where is the Palo Alto CARET Laboratory located? Such a building would likely have to have special permits because of being located near an earthquake fault line. Local fire departments may have to know the layout of such a building. Wikipedia lists the Palo Alto elevation at 30ft, So anything 5 stories underground would have to have a very reliable pumping system to avoid having the sea seeping into the basement. Could there be other locations in Palo Alto proper that have a high enough elevation to accommodate a 5 level basement? "... and a staff of over 200 ..."
This would indicate that there should be a parking lot close by or underground to handle many vehicles. I cannot imaging public transport being used by this type of employee. "... an office complex owned entirely by the military ..."
Does the military still own this office complex? An exhaustive search of all properties in the city might reveal such a large building still owned by the military. This has not yet been done. Is it common for the military to own such a secret complex in the center of a city or on the outskirts? Could it have been located in Mountainview, CA where many interesting buildings near Moffett Air Field like this one which appears to be a low-rise with parking for about 232 vehicles? "PACL closed up shop a few years after I left"
Does this mean that the building was torn down since then? Would the military have sold it to a private firm? "XPARC served as one of the models for the CARET"
I have already emailed an official at PARC who denied that they had anything called PACL. This person also said they had answered the same question posed earlier by someone else. And, they did not seem too interested in helping. Mr . X said that he "knows of four such facilities in the south bay that were active twenty years ago"
Mr. X Also said "There were other such facilities around the country..."
This makes some sense in that the name PACL contains the name of the city (Palo Alto) in which it was located. Other CARET Labs may have their city name as an acronym preceding "CL". Unfortunately Mr. X said at the time that he was too patriotic to reveal more, and the location was never revealed. So why was PACL named with the city name instead of just CL? OK "Isaac", I think it is pretty safe for you to come forward and answer these questions now. Just get a Gmail account and you won't have to worry about your IP address showing through. Yes, Isaac lets hear more. Oh, and I especially appreciate the inventory photo. For completeness: Isaac states 'PACL was located in Palo Alto, but unlike XPARC, it wasnÃ¢? ?t at the end of a long road in the middle of a big complex surrounded by rolling hills and trees. PACL was hidden in an office complex owned entirely by the military but made to look like an unassuming tech company. From the street, all you could see was what appeared to be a normal parking lot with a gate and a guard booth, and a 1-story building inside with a fictitious name and logo. What wasnÃ¢? ?t visible from the street was that behind the very first set of doors was enough armed guards to invade Poland, and 5 additional underground stories. Assuming the large number of armed guards wore uniforms, they either changed once inside and would also need a large parking facility and/or nearby accommodation given the urban-city settings or more than likely they were communally stationed/accommodated 'close by' in a military or security-type facility and transferred underground so as to avoid detection. (I would assume these guards did not live underground 24 x 7 for years of classified service.) Reasonably then, they would have been accommodated/stationed at a medium to large size security type facility within say a 5 mile radius of PACL. Assume also that PACL operated in the early eighties and the underground building complex would have taken at least 5 years of planning and construction to complete the facility. So it might be reasonable to assume the 'surface' details - the office and surrounding structures - are mid-70's style, with completed construction, certification etc around that timeframe. The land may once have been owned by the government and sold off in the late sixties or early seventies for commerical 'development', one of these developers being owned by an intelligence front. OK, that makes sense! Possibly a busload of workers from Moffett AirField arrived at the Palo Alto office a few times per day. This is within the 5 mile radius you suggested. Bob Lazar says "I was paid by the department of Naval Intelligence, and, what they're doing researching extra terrestrial craft is beyond me." From what I can tell by looking up this address, I think it is for Navy recruiting. So OTF's find may be a good one. 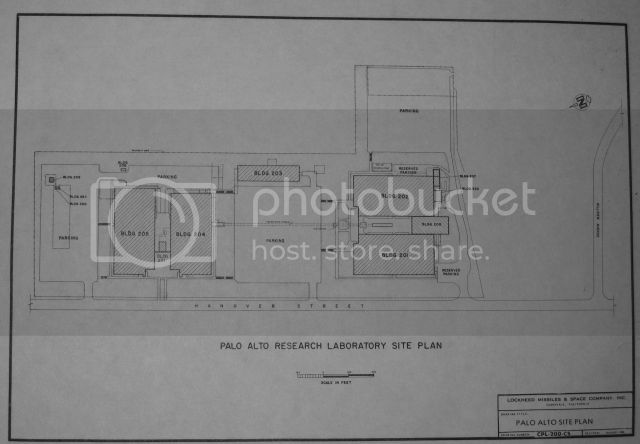 The probable PACL building in Palo Alto has already been located years ago. Do you all remember the site with the original single building [PACL] which is now surrounded by four additional buildings? The site fit Isaac's description perfectly. The site is on Google and was ID, as was the address and the year of construction. All of this is filed on this site somewhere. Thank you for that reminder. I have updated my original list above. My email to one representative there flatly denied any involvement in PACL, that is not surprising if it really was a secret. Isaac only said that PACL was modeled on XPARC. Maybe Xerox PARC took over the PACL building, or maybe one of those building on that site is PACL. Is there anyone reading that that is working at that location who can snoop around the basements and provide a confirmation/report? This could be so... I note only that Isaac said: 'PACL was located in Palo Alto, but unlike XPARC, it wasnÃ¢? ?t at the end of a long road in the middle of a big complex surrounded by rolling hills and trees. PACL was hidden in an office complex owned entirely by the military but made to look like an unassuming tech company. And simply turning on the "Terrain" option for Google Earth allows elevation under the pointer to be displayed in the status bar. I would imagine that any elevation greater than 50ft could easily accommodate a 5 story underground complex. After the meeting, the Lockheed manager for Corona rented his own hotel room in RickeyÃ¢? ?s Hyatt House in Palo Alto to start to plan the program. He needed to find a factory, separate from the already secret Polaris factory in Sunnyvale. He found an unused facility at the Hiller Helicopter factory on Willow Road in East Palo Alto which became the Lockheed Ã¢? ?Advanced ProjectsÃ¢?Â� facility. "East Palo Alto (often called EPA) is a city of about 30,000 residents in San Mateo County, California. It is situated between Palo Alto and the San Francisco Bay. While East Palo Alto is often mistakenly assumed to be part of the city of Palo Alto, but it has always been a separate entity from Palo Alto, even before it became incorporated as a city, with an entirely different demographic makeup." So we have three different cities quoted for a single address: East Palo Alto, Palo Alto and Menlo Park. If such confusion about city limits in the Valley is as common as in this example, obviously there's no point in strictly limiting the search to Palo Alto. So Nekitamo's post makes sense to me. If this account is real, then the defining characteristic of the 1 level building is the guard house... not many single story buildings would have such a thing! It might be possible to contact a local community forum for local knowledge of such an 'old' site. By the way, the googlemap link I posted earlier - if you zoomed into street view on google earth - the building has been demolished. I found a company phone book in a bookshop and noticed among their many facility maps the Palo Alto Research Laboratory. Google Earth shows it to be typical of many buildings in the high-rent, venture-capital area of Palo Alto with ample elevation to allow several underground levels. The site map reveals an underground pedestrian walkway and an elevator in the parking lot! If you want to find a Bay-Area-based company with hundreds of top-secret-cleared employees, armed guards, and government contracts, you need go no further than this one -- Lockheed.